I really like the look and feel of this bit of desert by Jonas Wide. 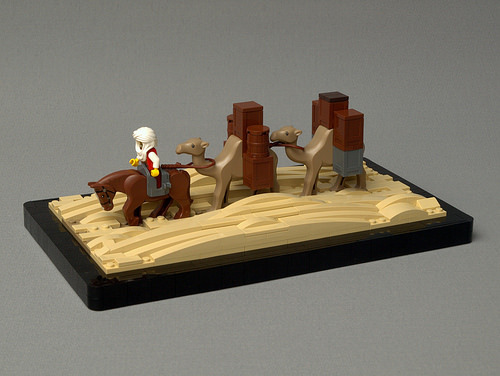 It depicts a merchant’s apprentice as he leads two heavily laden camels across the desert. Jonas really captured the look of wind-swept sand dunes and the subdued color scheme is surprisingly attention-grabbing. I have to admit that the current fad of putting a border around every castle creation is getting old but it really works here. The stark black outline makes the random patterns of the sand dunes pop! Another terrific build from the Lands of Roawia Guild Hall! I really enjoy seeing the non-combat builds that are fostered by the guilds. A nice change of scenery, for sure. I love the way the sand is done, it’s simple but very effective. I wish I could come up with ideas like that, I tend to get stuck with a mindset of straight lines and symmetry. The few exposed studs really capture the coarseness of the sand and contrast with the smoothness of the dunes. Magnificent.